These are lyrics by The Buggles that we think are kind of nonsensical. 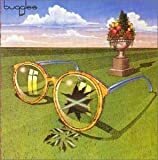 The Buggles', "Video Killed The Radio Star"
(Oh ah oh!) You were the first one! (Oh ah oh!) You were the last one!